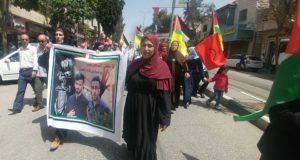 It is urgent that people take action around the world, as Khader Adnan’s persecution continues in his 58th day on hunger strike. On Monday, February 13, an Israeli military court rejected Adnan’s appeal. Adnan is being held without charge, on secret evidence. He is now in his 58th day of hunger strike, and entering an extremely critical health stage in which organ failure is imminent. 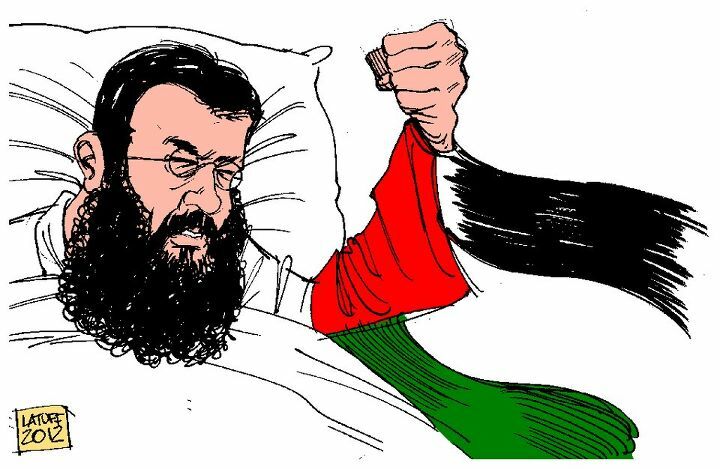 The military court’s action is an effective death sentence for Khader Adnan, who has refused to stop his hunger strike so long as arbitrary detention, torture and abuse continue in the occupation’s prisons. 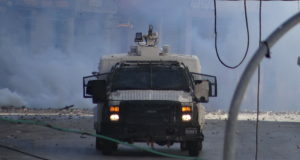 The Israeli military court action has shown once more the utter contempt of the Israeli occupation for Palestinian life. Khader Adnan has spent six years in Israeli prisons over different times in detention – almost all of that time with no charge or trial, held on secret evidence and at the whim of the illegal Israeli occupation. Heed Randa’s call. Action is URGENT now more than ever. It is time to occupy Israeli consulates and embassies, engage in solidarity hunger strikes, and protests. Please use this form to send us information about your local protests and actions. Khader Adnan is dying to live. Take action now to support him. 1. Organize a protest, occupation or solidarity hunger strike at your local Israeli Embassy (for a list, click here). Help us spread the word with social media after you take action. Download this photo of Khader Adnan to use for your social media profile pictures and click on the suggested messages below and they will be automatically tweeted. 2. Call your government officials and demand that they pressure Israel publicly and privately to release Khader Adnan. Call the Israeli Embassy in Ottawa at (613) 567-6450 OR your local Embassy (for a list, click here). Just last week, Baird stated that “There is not a government on the planet today more supportive of Israel than Harper’s Canada.” Call Baird’s office and let him know that this shameful declaration implicates Canada in Israel’s crimes and human rights violations. Demand that Baird’s office call for Khader Adnan’s release. Call the Israeli Embassy in Washington DC (1.202.364.5500) OR your local Embassy (for a list, click here). Demand that Jeffrey Feltman bring this issue urgently to his counterparts in Israel and raise the question of Khader Adnan’s administrative detention. 3. 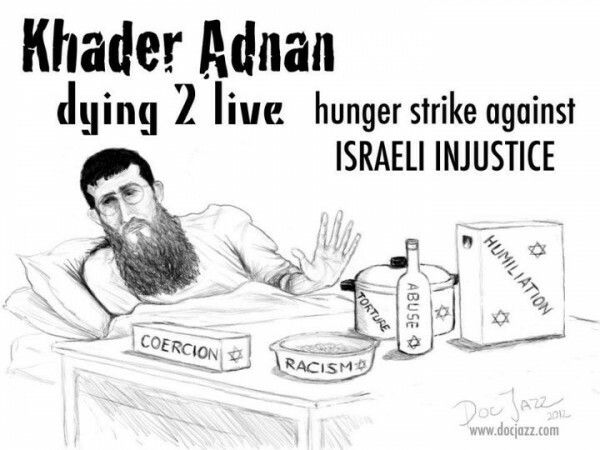 Write to Israeli officials and demand an end to delay and the immediate, unconditional release of Khader Adnan. Samidoun has provided a template and an automated letter-writing system. Send yours and make your voice heard today! 4. It is important to note the responsibility of the International Committee of the Red Cross. Sign this petition and join hundreds demanding that the ICRC exercise its responsibilities to protect Palestinian prisoners.